Love it or hate it, the Formula One halo is here to stay. Unfortunately for the series, a lot of people hate it. And it looks like there’s going to be a whole new reason to keep wishing for the old days. Fans tuning into the first free practice sessions of the Australian Grand Prix to see how this year’s cars look on track were treated to some shots from the onboard shoulder cam. Which, uh, weren’t that great. Maybe it’s just a learning curve, right? Teams testing out different locations for their cameras, seeing what works best for the coverage? Well… not so much. As per FIA tech regulations, “All cars must be equipped with four positions in which cameras or camera housings can be fitted,” and any changes to the camera housing configurations would have had to happen prior to June 30, 2017. So, with the halo not officially announced until July, there wasn’t much they could do. So F1 teams are at a little bit of an impasse this year. They can still play around with any of the other, more unconventional and pre-approved camera mounting points, but there’s not a whole lot they can do about entirely moving the location of the shoulder cam until 2019. 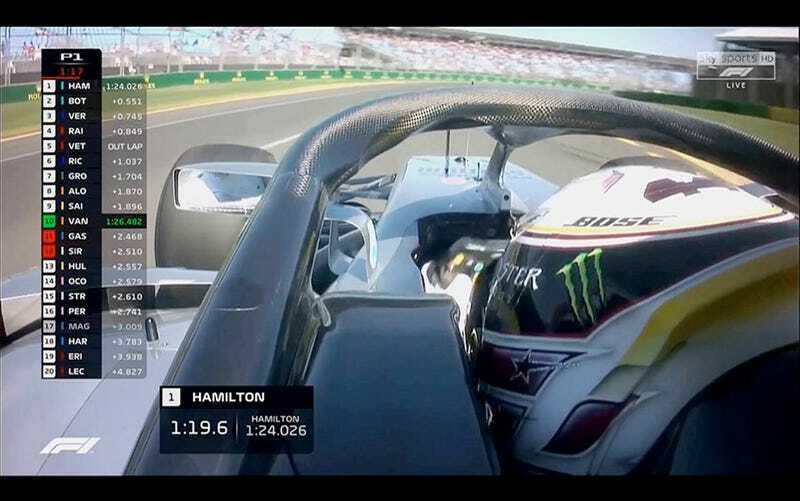 But look on the bright side: it seems that a hole was made in the front of the halo for the purpose of mounting a camera! Hopefully someone, somewhere is testing out the view from the front of the halo. However, because it wasn’t one of the FIA-cleared mounting points, we probably won’t be seeing any hasty changes this season. Which, to say the least, won’t be doing any favors for the halo’s reputation. At least the overhead camera shots are still pretty awesome.